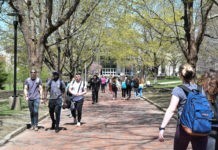 The University of Rhode Island changed the type of cable they provide to residential halls over the summer, removing cable television, and focusing more on faster internet. As more and more students use online streaming services, the need for cable television to be provided in residence halls seemed like an unnecessary cost for URI. According to David Porter, director of media and technology services, URI was paying about $300,000 a year in contract with Cox. This price included WiFi and analog channels but did not include HD channels, something that students wanted. When it was time for the contract to be renewed, URI would have seen a 20% increase in the contract itself, with cable needing around a $100,000 upgrade to “bring it up to speed” according to Porter. If URI was to update the cable, students would have seen an increase in their communication fees within their tuition. “The question was do we make this investment and increase [students] rates or focus on an infrastructure and lower [students] rates,” Porter said. Housing and Residential Life spent about three years figuring out what students wanted. They conducted focus groups, talked to students and presented to student senate. Their findings were that students were bringing in their own content, such as Netflix, Hulu or online family accounts, as well as more devices to connect to the WiFi. HRL decided to cut cable television, focusing more on the internet, the wireless performance already going up according to Porter. “Communication fees went down about $100 per student,” Porter said. He also said how students can still get digital channels. While this may have been a cost-saving decision, many students are left wondering if their experience in resident halls will be negatively affected. Ryann Pignataro, a junior living in Wiley, tends to watch cable television more so than online streaming services. “I would prefer to have cable TV provided in the dorms because it creates a sense of community between myself and my friends,” Pignataro said. While URI notes that many students have access to their own streaming services, Emma Schram, a freshman, wonders about students who can’t afford those services. 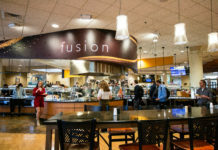 Housing and Residential Life encourages students to connect laptops and gaming consoles as each residence hall’s TV is equipped with an HDMI cord in the main lounge.